West Ham stagger towards the finishing line one point at a time. The self-styled best league in the world managed to serve up a complete boxed set of drab fixtures for a Saturday afternoon. Despite Leicester’s unexpected success last season there has been a return to predictability where the sole objective of 70% of clubs is merely to survive to live another year in the money generating environment of the top flight. Generally, it does not make for great entertainment and I get a sense that the overseas broadcasters are making a gradual move to the Bundesliga for their routine everyday football coverage. The Premier League is becoming more and more like La Liga where interest beyond a limited number of glamour clubs is minimal, and when games are more about attrition than entertainment then it is not surprising that appeal does not extend to a wider audience. As our game at Stoke progressed yesterday it was apparent that the priority of both sides was to preserve the point they started the day with rather than striving for more. I guess that after losing five games on the bounce then a sequence of four without defeat has to be seen as a positive. The six points earned in those games against Swansea, Sunderland, Everton and Stoke are probably enough to keep West Ham safe. I have not seen anything in the performances to convince me that things have been turned around or that the ship has been steadied but it is an improvement of sorts. Two cleans sheets in a row is not a regular West Ham phenomenon and it may well be that Bilic has accidentally and belatedly stumbled on a way to organise his defensive resources. Listening to some debate after Sunderland’s demise on the position of David Moyes it was interested to hear a reasonable level of support for the Scot. The argument being that Sunderland have lived for so long on the brink and focusing on short-term survival that time is required for someone to perform surgical rebuilding. This is the great danger arising from our own lack of progress this season where there is no clear style of play and stuffing the squad with older or journeyman players. Only a forward looking plan can elevate us above the relegation haunted pack on an ongoing basis. With three games to play West Ham are yet to be mathematically safe. The points cushion plus goal difference should be enough but when the number of clubs below you (who are still able to catch up) becomes fewer it is not the time to stop looking very carefully over your shoulder. Past performance may suggest that both Hull and Swansea are unlikely to embark on sudden winning sprees but, as we are always reminded, past performance is not necessarily a predictor of future results. Swansea getting something out of their visit to Old Trafford today would certainly bring the cats and pigeons in a proximity that is too close for comfort. The overall table has a very lopsided shape to it with fourteen points separating 7th from 8th but only six points separating 8th from 16th. Theoretically a top ten finish is still possible for the Hammers although 16th or 17th seems a more likely outcome. In the circumstances of who was available, the starting lineup yesterday almost made sense. It has been reported that Diafra Sakho’s absence was due to (another) back injury (and not a Di Canio style travel sickness) and with Andy Carroll also absent we were lumbered once again with Jonathan Calleri. What Calleri has to offer remains a mystery to me and why he is preferred over Ashley Fletcher despite contributing little is puzzling. Some claim that Calleri runs around a lot but that is no more a rational for selection than being born in Canning Town. At least Calleri’s inappropriate rabona introduced some lighthearted comedy value into the game. Nordtveit and Kouyate in central midfield did much to protect the defence and the three central defenders were all solid, including a man of the match performance from Winston Reid. Personally, I thought Fernandes did well enough out of position at right wing-back but I still may have been tempted to have gone with Sam Byram. Slaven Bilic has built up a reputation for his game changing substitutions. Unfortunately these have a close correlation with the reputation for losing points from a winning position. It seems that the Cresswell for Masuaku was due to injury so no real complaints with that one but the later changes were strange to say the least. Ayew looked to be our greatest goal threat so the decision to replace him, rather than Calleri, was odd enough but bringing on Noble as the replacement only compounded it. It effectively removed any notion that we would try to win the game and handed the initiative firmly to Stoke. Ending the game with no strikers at all only added to the negativity even if the game was petering out by then and replacing Calleri with Snodgrass was hardly likely to make matters worse. Matchday: Hammers to smash Potters? The battle for mid-table supremacy is at stake in this mouthwatering end of season encounter. If it wasn’t for the remote mathematical possibility that either of these two sides could still be relegated then this match would be about as pointless as they come. In fact the fixture computer has come up with a set of Saturday matches so uninspiring that an afternoon spent in the shed sorting your tools into alphabetical order sounds a more attractive proposition. Today’s five Premier League matches feature only two teams from the top half of the table. It could be pointed out that merit based payments mean an extra £2 million per league placing but I doubt that this is much of a motivating factor for the average minted footballer. If there is only pride to play for then it could be a very drab ninety minutes, even though Slav insists that we are treating every game like a cup final (if anyone can remember what one of those is like!). People are talking about who is safe but it is irrelevant. We have four games left, a big game on Saturday and we are looking for points. There is a gap between us and mid-table, it is a small gap but with four games to go we are talking about 12 points and we have to concentrate on our next game. We are approaching them as four cup finals. The supercomputer at Euro Club Index has crunched the numbers and by their reckoning we will finish the season in 15th place with 42 points, two points and four places below today’s opponents at the blandly dubbed bet365 stadium. The computer further concludes a 29% chance of a West Ham victory this afternoon, without which the opportunity to accumulate the predicted end of season total of 42 points appears improbable. With Stoke situated close to the unhappy hunting grounds of the north-west it is unsurprising that we have a second rate record from our visits over the years, having won just ten times from thirty eight attempts. The last three away victories, all by the only goal of the game, came in 2005 (Bobby Zamora), 2009 (Diego Tristan) and 2013 (Jack Collison). Despite West Ham’s striker woes, the Hammers have only failed to score in three away matches this season (Arsenal, Everton and Leicester) so perhaps another solid defensive display will allow us to sneak one more one-nil success. Mark Noble and Sam Byram return to the squad after suspension and apparently Robert Snodgrass and Sofiane Feghouli are also available again (if anyone is interested). On the other hand Cheikhou Kouyate, Winston Reid, Arthur Masuaku and Diafra Sakho are all reported as injury doubts for the Hammers. If everyone was available my only change would be Sakho for the hapless Jonathan Calleri and, maybe, Byram in for Edmilson Fernandes. I would stick with Havard Nordtveit and Kouyate in central midfield as the Kouyate/ Noble partnership has proved not to work on countless occasions and Nordtveit/ Noble would be criminally slow. I fully expect, however, that Noble will be back in the starting eleven. The mood’s fine. We’re looking forward to the game tomorrow. It’s an important one for us clearly. Stoke may be missing Jon Walters who has regularly been a thorn in the side of West Ham and for the determinists/ fatalists among us the disturbing fact that Saido Berahino has scored in three of his four previous starts against West Ham but hasn’t scored a Premier League goal since February 27th 2016 will have the alarm bells ringing. Appropriately for West Ham, it is injury prone Lee Probert from Wiltshire refereeing today’s game. Probert missed all last season due to injury and takes charge of only his second Premier League game of 2016/17. His last meeting with the Hammers was in the unforgettable 3-0 victory at White Hart Lane in 2013. In a grand total of twenty eight games this season he has issued a conservative sixty four yellow and four red cards. What a season to choose to bet on West Ham! The sheer unpredictability of our team, and our ability to throw away more points from a winning position than any other team in the Premier League has been our downfall, and is a lesson in not to bet on them. Our loss last week meant that our running total is now down to minus 99 points for the season. Fortunately I have got some more funds to invest, so this week I am going to try something different. I am going to bet on us to lose the game at Stoke. I really don’t mind losing the bet if it brings about a change of fortune in our results. Stoke are 11/10 to win the game, and though they have not had the best run of results lately I am going to stake 40 points on them to beat us. They are also 11/4 to win the game to nil, and with our lack of firepower I believe (unfortunately) that this is a good bet too. By staking 60 points on the game then this brings our balance down to minus 159 points. I really hope that I lose the bet and we get something out of the game. But if we don’t there is a minor consolation of a winning bet or two. In fact if Stoke do win the game and we fail to score then our return would be 159 points, and would wipe out our deficit entirely. Not sensible betting I know, but I can’t lose can I? If we lose the game then I win with the bet, and if we get a draw or win, then that will bring us closer to safety. The potential returns are in brackets. What are the chances? A visit to the Potteries to face a Stoke side aiming for at least a ninth place finish for the fourth season in a row. I have to own up. In the recent past when Tony Pulis was their manager, one team that I disliked intensely for their style of play was Stoke City. I couldn’t knock their effectiveness, but I just hated to watch games against them, especially in the days of the Delap long throw. Under Mark Hughes they are not favourites of mine either, but their style has improved somewhat, they have some skillful players mixed with their uncompromising ones, and they have become a fixture in finishing in the top half of the Premier League. For the past three seasons they have finished in a very creditable ninth position, and with just four games to go of this campaign they sit eleventh, just one point away from ninth, which must be the aim of a cluster of clubs, including ourselves, who can all reach this place in the table with a good finishing run. A bit like ourselves, they began the season disastrously, and at the end of September after six games, they had been beaten four times and drawn two games to leave them in the relegation zone at this early stage. But they did have some difficult fixtures at the beginning, and a kinder group of opponents, including Sunderland, Hull, Swansea and ourselves, enabled them to win three and draw two of their next five games, picking up 11 points in the process and found them climbing the table rapidly by Guy Fawkes night. Two wins in their next three games against Watford and Burnley meant even further progress upwards by the start of December, but then the remaining fixtures of 2016 yielded just two points from five games. Eight points in the first four games of 2017 meant another upturn in league position, but their defeat on 4 February at home to West Brom, and our win at Southampton that weekend, meant that we sat in 9th place in the table, two points clear of them in 11th. Then they picked up 7 points in their next four games, including a creditable goalless draw at Manchester City (who had put 4 goals past them in their first home game of the season at the Bet 365 stadium). Since then they have had another poor run of results winning just one (at home to Hull), and losing five of their last six games. So what can we conclude from this brief analysis of our opponents this weekend in trying to predict the outcome of the game? Not a lot really. Generally they have beaten weaker teams, and lost to the top teams, in a roller coaster of a season with inconsistency to match our own. Recent history of fixtures against them does not bode particularly well. This will be our tenth meeting with them since our return to the top flight. In the nine matches played, Stoke have won three, and five have ended as draws; our solitary victory was a 1-0 win on their ground in March 2013 thanks to a Jack Collison goal. We should have beaten them in the final game of last season when a stirring first half performance should have seen us go in at the interval with more than a one goal advantage given to us by Michail Antonio. But the euphoria of the final game at Upton Park just a few days earlier wore off, and in typical West Ham fashion we allowed them back into the game with an equaliser early in the second half, before Diouf wrapped up the three points with a goal two minutes from the end. It was a game that mirrored the final fixture of the previous season (against Everton) where we took the lead and had control of the game before conceding an equaliser against the run of play, and then lost it in stoppage time. At least we have halted our run of five consecutive defeats by picking up five points from our unbeaten last three games, edging us towards safety. We are not quite there yet, and could do with another point or three to ensure mathematical safety. Will we get them this weekend? I certainly hope so, but in all honesty I really don’t know. As the season and our prediction challenge gets close to a climax it is still all to play for. In Week 34, Rich scored 7 points, Geoff 6 points, and Lawro 3 points. This means that Lawro’s lead has been cut to 8 points. With just four weeks remaining and the finishing line coming into view can a jittery Lawro retain his position at the top? The contest is becoming almost as exciting as the scoring in Eurovision. It is amusing that some folks take Lawro’s predictions to heart (see this post on the Claret & Hugh web blog). It is only a bit of fun and about as serious as your daily horoscope. In an inconsistent season results have been notoriously difficult to predict. Now is the time to proceed to week 35. Criminal transfer dealings take the spotlight away from managerial speculation. The big football story of the week so far are the dawn ‘raids’ on West Ham and Newcastle by the old ‘tax’ bill. What we really know is limited to a number of short press releases that seem to suggest a joint operation with French authorities (take back control of our tax dodges) and relates to tax irregularities associated with transfer dealings, most probably involving Olympic Marseille with whom both Newcastle and West Ham have had dealings. Reportedly, a number of people were arrested although the only name that I have seen mentioned is Newcastle managing director Lee Charnley, who was later released without charge. There has been no indication as to whether the other arrests were in England or France. It seems Chelsea were also spoken to (but not ‘raided’) which suggests that our cooperation may be more sinister than simply providing evidence. A figure of £5 million has been mentioned which seems a rather small amount to warrant such a huge operation and raises the prospect that the story still has some way to go. I know that many of us believe that our transfer dealings have been criminal but not for tax evasion reasons. Cases like this are normally and historically very complex and will take years to conclude. Any sanction forthcoming will likely only happen at the very point that we finally claim a Champion’s League spot. The unexpected point last weekend and then the events of yesterday have momentarily taken the focus away from the future of West Ham manager Slaven Bilic. It doesn’t take much to swing the pendulum of optimism back into positive territory but judging by the exuberant reaction to our clean sheet I was half expecting an open-top bus parade to celebrate stopping Lukaku from scoring (I wonder what route the bus will take in the future?). No denying it was a good defensive performance and I guess the manager deserves some credit for finally learning from the mistakes of the previous 30 or so games (even if it was by accident). All eyes on a repeat at the weekend. Adrian back in goal at the weekend instilled some much needed comfort and confidence but there remains a sense that an upgrade in the custodian department is a necessary priority. Sorry to say, though, that the thought of a keeper who has been plying his trade in the Turkish league (Onur Kivrak) doesn’t thrill me. Hopefully, it is not true and that also goes for most of the other players that I have seen linked with us so far; who are either past it or have failed miserably at their current club. Like others my own persoanl bias tells me which rumours I want to believe and those that I don’t; to date I don’t (want to) believe any of them. One of the names linked in a managerial capacity with the West Ham hot seat, should it become available, is Simone Inzaghi from Lazio. If he did somehow end up at the London Stadium I would love him to bring Ciro Immobile with him. An aptonym is when someone’s name fits their job perfectly; like Belgian defender Mark De Man, tennis player Margaret Court or Mr Bun the Baker. Immobile the West Ham striker would just seem too good an opportunity to miss. A first relegation, fixture backlog, Euro success and the end of an era feature in the week 24 – 30 April in Hammer’s history. 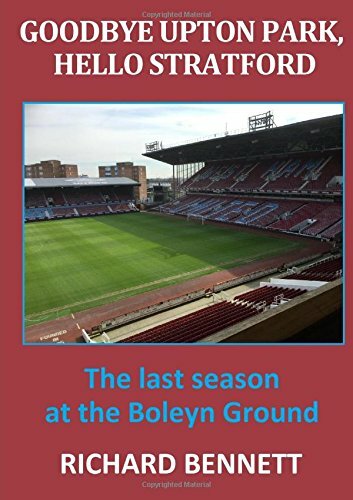 There was a life lesson to be learned in the week 24 to 30 April in Hammer’s History when in 1978 West Ham experienced what was, for me, a first relegation. All of my West Ham memories had been as a top flight club and as far as I was concerned that was how it was always going to be. There had been scares and scrapes in the past but we had always managed to slip clear in good time and this was a team that 2 years earlier had featured in a European final. Before West Ham’s final game of the season in 1978 they sat 18th out of 22 clubs. A midweek win at Middlesbrough had briefly seen the Hammers rise to a season high 17th and escape was still possible on the final day even though rival teams still had more games to play. The opponents at Upton Park were Liverpool and the West Ham desperately needed to take something from the game. The first half was an evenly contested affair until shortly before the break a misplaced Pop Robson pass heralded an incisive Liverpool move that ended in a Terry McDermott goal. West Ham responded with spirit in the early stages of the second half but when David Fairclough outpaced Billy Bonds to make it 2-0 it was game over. A Wolves victory over Manchester United and a point for QPR on the same day effectively sealed the Hammer’s fate. Relegation back then did not mean a change of manager or a file sale of players and John Lyall was able to rebuild around the talents of Brooking, Devonshire, Bonds, Martin, Lampard and Cross; the core of the team that would go on to win our last major trophy in 1980 and evolve into one that earned our highest ever league finish in 1986. It seems unthinkable now but during this week in 1986 West Ham played three home games in five days to record victories over Coventry (1-0; Cottee), Manchester City (1-0; Stewart) and Ipswich (2-1; Dickens, Stewart). By the end of the week West Ham sat in second place, four points behind Liverpool with a game in hand but just two to play. The same eleven players featured in all three matches: Parkes, Stewart, Parris, Gale, Martin, Devonshire, Ward, McAvennie, Dickens, Cottee, Orr. Goddard came on as a substitute to replace Orr in the Ipswich game. Heading back to 1965 and possibly one of West Ham’s finest ever performances away to Real Zaragoza in the semi final second leg of the European Cup Winner’s Cup. Holding a slender 2-1 lead form the first leg, the Hammers were underdogs against the Spaniards who packed an array of attacking talent and would be fully expected to score. To make matters worse West Ham had lost playmaker Johnny Byrne to an injury sustained while playing for England three days earlier. Real Zaragoza dominated the early stages and took the lead after 23 minutes with the Hammers were in real danger of crashing out. However, a disciplined defensive performance, led by a supreme Bobby Moore, and tactical half-time changes allowed West Ham to claw their way back into the game and after 55 minutes Sissons got on the end of a Dear pass to equalise. The Hammers held on for a draw and booked their place in the Wembley final against TSV Munich 1860. One final match to mention is the game played on 30 April 1988 which was notable as the very last of the record breaking 799 appearances for West Ham by William Arthur Bonds.